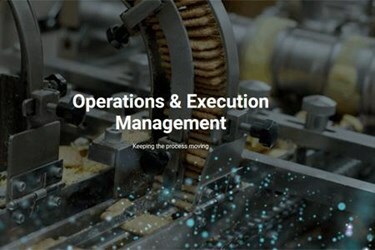 Where equipment performance management strives to keep equipment operating at peak performance, operations execution management involves using that equipment to its fullest potential. This requires ensuring that all facets of the operation—materials, people, processes and equipment—act in concert, securely and in compliance with industry, customer and product specifications. Digitizing, integrating and standardizing information flows and processes across operational domains and systems helps to improve operational efficiency, enforces predictable quality, increases business agility and provides a foundation for continuous profitability and sustainability improvement. It assures that operators, supervisors, managers and other decision makers have timely information to manage the order flow and production execution effectively. Integration with automated equipment allows for setup parameter download, bill-of-material enforcement and procedural execution automation for production to recipe specification. Furthermore, it tracks the transformation of products from raw materials to finished goods, monitoring production according to quality specifications and gathering information on resources and asset utilization. Finally electronic workflow management not only enforces manual procedures, it connects the people and systems responsible for material logistics, resource and business planning, quality and asset management empowering them for effective, collaborative coordination.